Controversy abounds on who exactly invented the Whoopie Pie, but having grown up in Maine I’m going to take a local stance and declare that they were invented in my home state. Of course if you’re from Pennsylvania, Massachusetts, or any other New England region you’re also welcome to proudly make this claim because Mr. Wizard probably couldn’t unravel this culinary mystery. What I do know is that I grew up on chocolate Whoopie Pies with fluffy white filling and to this day my mother will honestly call me in order to specifically discuss a delicious dessert that she happened to pick up at a grocery store, bake sale, or farm stand. The absolute best Whoopie Pie that I ever tasted came from the Maine company, Wicked Whoopies. Wicked Whoopies was actually featured on Oprah’s “Great Gift” show back in November of 2003. My heart still resides with their blueberry Whoopie Pie, and I’ve yet to taste its equal. Unfortunately it doesn’t appear as though they make that flavor anymore, but trust me — it was to die for. 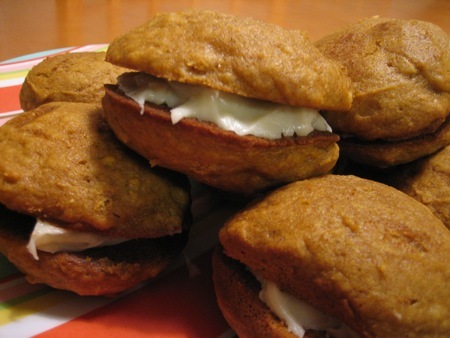 My second favorite flavor is pumpkin anything so when I came across the recipe for Pumpkin Whoopie Pies in Rachael Ray’s October issue I promptly added the ingredients I needed to my grocery list. Of course my mother called me to make sure I’d seen it too. She was just as excited as me to try it! Fortunately, this recipe is ridiculously easy. I suggest you make a batch for everyone that you know, or at least your office mates. 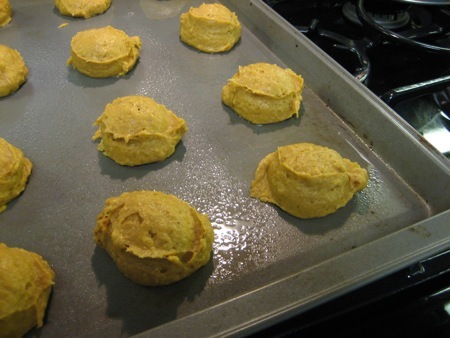 These pumpkin treats will win anyone over and than they’ll owe you favors forever. 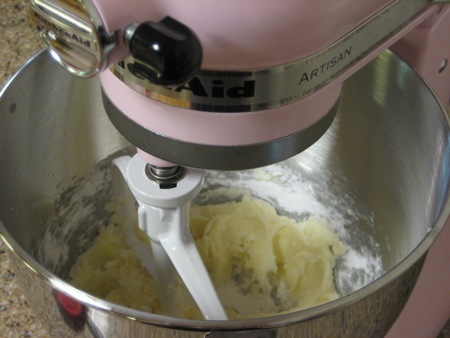 Meanwhile, using an electric mixer, cream the softened butter with the cream cheese. 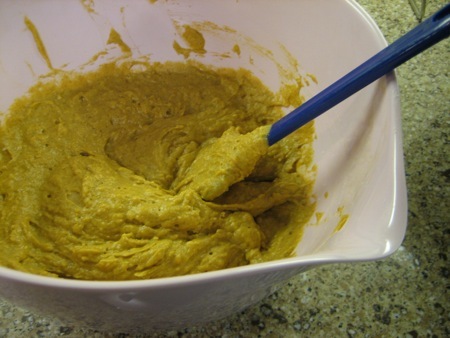 Add the confectioners’ sugar and the remaining 2 pinches salt and 1/2 teaspoon vanilla; mix on low speed until blended, then beat on medium-high speed until fluffy, about 2 minutes. I totally forgot about those! Didn’t we go to the Mellon Street Market and buy a box of white cake mix and than stuffed them with pink and purple icing? I’m pretty sure we probably washed them down with Sam Summer too. Ha ha … those were the days. 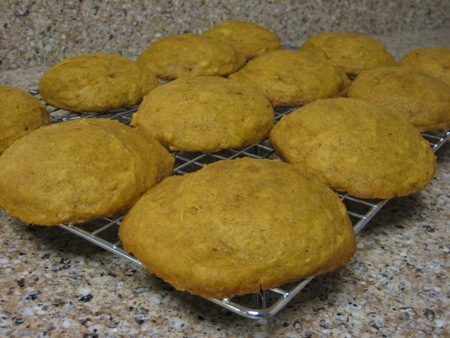 I love pumpkin cookies, so I can’t wait to try this!! I promise you wont be disappointed. Although if you like a lot of filling in your whoopie pies I’d definitely urge you to the double the filling recipe since it really only makes about a cup of frosting.